The role of simulation is tested in attempting to determine the most appropriate design layout for the Pearson Airport Air Rail Link arrival terminal. The spatial layout of three major areas affects the movement of passengers that use the Air Rail Link: (1) the Air Rail Link (ARL) Light Rail Vehicle (LRV), (2) the ARL station platform and (3) the vertical transportation system (VTS) at the end of the platform. In addition to the ARL, the terminal also houses the station of the Airport People Mover (APM) monorail, a separate mode of passenger transportation. Through the use of pedestrian micro-simulation model Oasys MassMotion, a suitable design will maximize the efficient and comfortable movement of passengers throughout the system while also considering factors such as safety, ARL capacity and passenger amenities. This research is significant as it will ensure that the design of the overall ARL system at the Pearson Airport arrival terminal, including LRV, platform and VTS design, is as efficient and enjoyable for the ARL customers as possible. In order to ensure the development of an appropriate design layout for the ARL system, design alternatives were considered for each of the three major areas of the terminal, and a best alternative was chosen through a research plan comprising of the following steps: (1) The selection of design alternatives for the LRV and station platform, (2) The development of a thorough group of assumptions regarding the intended use of the LRV upon which to base the entire project analysis, (3) The establishment of appropriate scorecard for metric-based evaluation of the alternatives, (4) The analysis of design alternatives using a metric scorecard to determine the most appropriate designs, (5) The construction a pedestrian simulation model to test the design alternatives, (6) The analysis of the results of model to determine the most appropriate design, (7) The development a detailed plan of the most appropriate design layout, and (8) Support the design criteria of the most appropriate alternative through both metric-based analysis and simulation results. The project summarizes the findings of the design, simulation and analysis process and in doing so, justifies the appropriateness of the final design concept for an efficient and optimal passenger experience. Visualization of Levels of Service metric based on pedestrian speed and density. Simulation of alternative vehicle car designs: (1) SMART car, (2) Bombardier 482, (3) Bombardier 423 EMU. 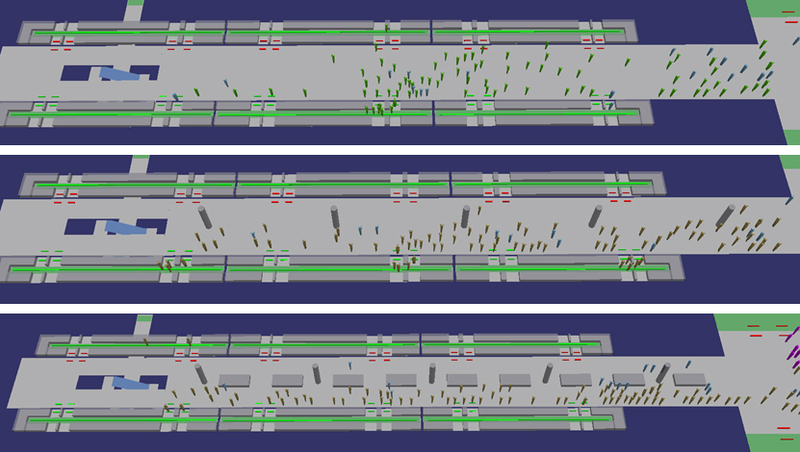 Simulation of alternative platform designs. Timeline of terminal through simulation phases: (1) APM pre-boarding, (2) APM boarding, (3) APM post-boarding, (4) ARL post-boarding, (5) APM pre-boarding.